We love doing upgrades and have done many since acquiring the hotel in 2012. Since then we have poured into enhancing the guest stay experience in; building a breakfast room, upgrades to WiFi internet service, adding laundry and vending facilities, as well as ski storage and dedicated ski waxing room complete with air exchange, and a bike tuning station. Reservations are underway currently in our Timber Building for 32 Standard Two Queen Guestrooms. We are excited to reopen these rooms to our guests in the late spring of 2019. 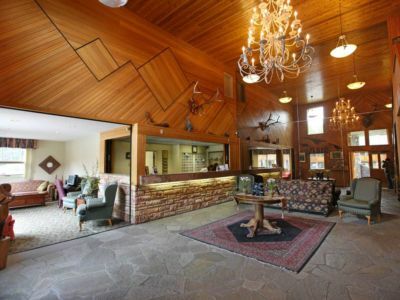 The Main Lodge Building, where the hotel lobby and the indoor hot tub are located, has the authentic "lodge" feel with grand ceilings, wood interiors and local wildlife mounts. Adjacent to the Front Desk is a cozy reading room where guests enjoy complimentary coffee while checking the weather report or planning activities. The Timber Building, known as the Original Building, offers a motel layout of accommodations through exterior entrances on two floors. 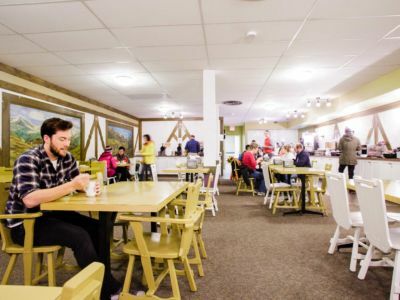 The Timber Building is home to the breakfast room, ski waxing room, laundry facilities (washer/dryer), vending machines, ski storage, and parking area. The Mountaineer Lodge does not have an elevator. Wheelchair accessible rooms are available upon request. Please contact us directly to book your wheelchair accessible room. You are going to need a good start to fuel your day of hiking, skiing, sightseeing or just walking around Lake Louise and Banff. Breakfast is included in all hotel reservations. Continental Breakfast is served daily in the Breakfast Room, located on the basement floor of the Timber building. In slower seasons, hours and menu may be modified. 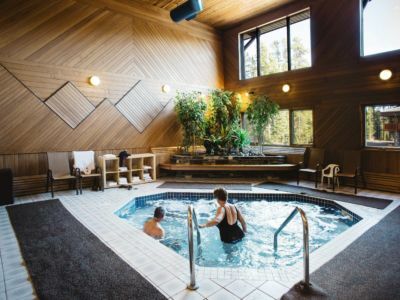 After an exhilarating day outdoors in Banff National Park retreat and relax in the Mountaineer Lodge's steam room or indoor hot tub. This area is open for guests from 8 am to 10 pm. Towels are provided by the hot tub. The lobby lounge is located adjacent to the Front Desk. Here you will find a relaxing atmosphere to read a book or read up on the area activities. A computer station with desk and chair provides free Internet for staying in touch with loved ones or consulting your Lake Louise vacation itinerary. Coffee is served in this space free of charge. The laundry area is located in the Original building, on the way to the Breakfast Room. 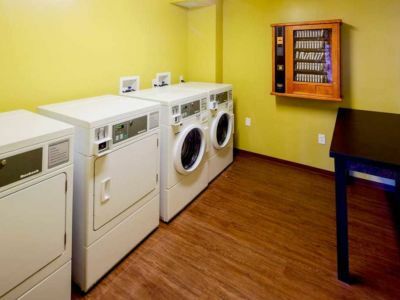 Two coin washers and two coin dryers are available for guest use 24 hours per day. Soap and softeners are available for purchase at the vending machine. Change is available at the Front Desk. Ski Storage: The Mountaineer Lodge kindly requests that skis, snowboards and poles are stored in our secure ski storage. The ski storage area is available upon request at the Front Desk. Ski Waxing Room: We know you want your gear tip top so we have built a ventilated ski waxing room. This area is locked and available upon request through the Front Desk. It's free, fast and frequent! Free shuttle services are available from the doorstep of the Mountaineer Lodge to the Lake Louise Ski Resort during the winter. See shuttle times and locations posted above. The Mountaineer Lodge is also pleased to provide; free parking, free WiFi, activity planning services, transportation bookings, and Lake Louise dining recommendations. If you are heading on to Jasper, please ask our Front Desk staff to make a reservation for you at our sister hotel, the Mount Robson Inn, at a discounted rate. 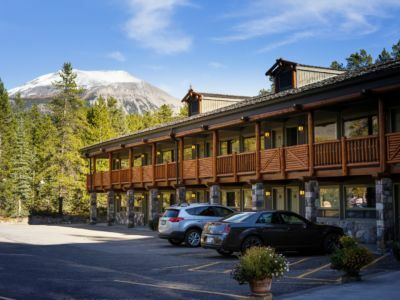 The Mountaineer Lodge management and staff strive to provide the amenities that our accommodation guests are looking for when visiting Lake Louise and the Canadian Rockies. Please let us know how we can improve your stay and the future stays of you and your fellow guests.